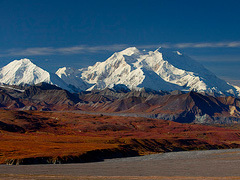 Join our popular Denali Driving Tour from Anchorage. Discover famous Denali National Park - one of Alaska’s most popular attraction and destinations in the shadows of towering 20.320 ft. Mt. Denali. 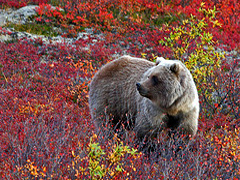 Denali National Park is the natural habitat for more than 380 Grizzly Bears, Moose, Wolf, Fox, Lynx, Dall Sheep and Caribou. 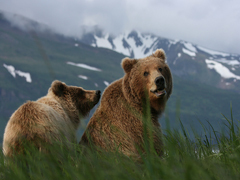 It is most likely you will spot some of them while taking our full day shuttle bus or Tundra wildlife tour. You may also enjoy other Denali activities: short guided hikes, Nenana rafting or float trip, backcountry jeep adventure, guided helicopter hiking trips or a sled dog demonstration. If you are of adventurous nature book a flightseeing or helicopter tour around Mt. McKinley and the Alaska Range. The leisure drive from Anchorage provides many spectacular vistas of the Alaska Range. You may take a side trip to Wasilla and visit the Iditarod sled dog tour headquarter, Talkeetna - the base for all mountain climbers or take a canoe trip on Byers Lake in scenic Denali State Park. Please Note: The self drive tour is also available from / to Fairbanks. On your return tour to Anchorage don’t miss the opportunity to visit Talkeetna - the base for all mountaineering and flightseeing activities within Denali Nat'l Park. Alternative Routing: From the Parks Highway drive via Hatcher Pass Road to the Independence Mine Historical Park - operated from 1938 - 1941 by one of the largest gold producers in the Willow Creek Mining District, - the Alaska Pacific Consolidated Mine Co. Continue via Palmer - located in the heart of the Matanuska Valley to Anchorage. In the afternoon outdoor enthusiasts may enjoy a stroll along the 12-Mile Coastal Trail with never ending view across Cook Inlet and toward Mt. McKinley and the Alaska Range before you return your rental car. A: What is the difference between single, double, triple and quad room? The maximum occupancy per room is four. We can arrange our self drive tours including 2 rooms and 1 rental car if your group is larger than 4. Yes, we can substitute our advertised hotel category with bed and breakfasts (B&B) accommodation (breakfast included) for any of the advertised itineraries. Please contact us for availability. No - we do not provide any one way rentals between Alaska (USA) and the Yukon Territory (Canada) Certain government and insurance regulations do not permit such rentals. 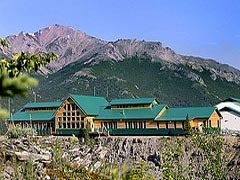 We offer one way rentals to Skagway, Haines & Juneau. Yes, the rental of a compact car (automatic) is always included in our flex drive tour packages. Additional rental days or upgrade details and rates for mid and full size car, passenger vans or a sport utility vehicle (4x4) are available on each self-drive page. All upgrade rates are per car and not per person. Our advertised rates include also local taxes, unlimited free mileage, airport concessionaire fees, licensing fees. Rental car insurance is optional. Many Americans have their own car insurance that also covers them with the rental cars. Please contact us if you require rental car insurance. We provide a complimentary transfer from your downtown hotel to the rental station. A valid driver license and a valid major credit card are mandatory for all individual vehicle rentals and/or tour packages including vehicle rentals. Driving on gravel roads/highways is at own risk. The rental car insurance is void on the following highways Denali Highway, Dalton Highway, Top of the World Highway, Taylor Highway, McCarthy Road, Dempster Highway and all other gravel roads. You will be responsible for any damages. Drivers have to be more than 25 years of age and the drivers license has to be valid for more than 1 year. Contact us if you are below 25 years of age. We do not anticipate anything but you can contact us, the rental car company or any of the pre-reserved hotels for assistance. We have a 24 hr emergency help line available for our guests. The Visa/entry requirements do change frequently. Please check requirements on the appropriate government pages. We are unable to take any responsibility for such information however you will definitely need your passport. Please ask us if your self drive tour enters Canada. Please refer to the appropriate tour page for a listing of included services. Our service generally includes the rental car, accommodation, applicable local taxes, ferry trips as scheduled, sightseeing as per itinerary, a detailed tour description, highway or road logs. Not included are: Meals, highway tolls, gasoline, entrance fees, additional sightseeing tours. May, June and September are perfect months for a vacation in the Land of the Midnight Sun. The weather is usually stable and sunny with almost 24 hours of daylight. July and August are prime travel months and are obviously very busy. Due to the long daylight hours (up to 24-hours) during the summertime, it is impossible to see the Northern Lights (Aurora Borealis) from approximately mid May until the middle of August. Northern Lights are occuring mainly during the fall/winter months from end of August until the beginning of April. For further information please refer to our winter tour program. A: Should I purchase travel insurance ? We strongly encourage you to purchase travel insurance to cover: cancellation fees associated with an outing as well as airfare or other nonrefundable expense in the event you need to cancel a trip; medical expenses incurred on a trip; and the cost of a possible medical evacuation from a trip. We have made arrangements with Allianz Travel Insurance Services for you to purchase a comprehensive travel insurance plan. Feel free to contact Allianz if you have questions on this policy or its coverage as we are not equipped to provide specific answers to questions on the insurance program.